Coeur d'Alene attraction are numerous. Take in the beautiful scenery of Lake Coeur d'Alene or one of the nearby state parks. 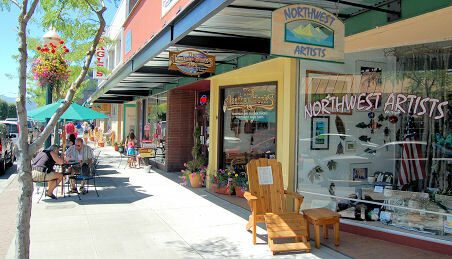 Stroll the downtown area to see the local artists' art in the galleries. Learn the area's history at Coeur d'Alene's Old Mission State Park which features a restored Parish House, a historic cemetery and a visitor center with exhibits. Tying the knot? Weddings are very popular here in this scenic city. Read this page for more information on what to see while visiting Coeur d'Alene. Summers Glass. 211 E. Sherman Avenue, Coeur d'Alene, ID 83814. Phone: 208-665-0875. Coeur d'Alene Galleries. Located at the Coeur d'Alene Resort: 115 S. 2nd Street, Suite A, Coeur d'Alene, ID 83814. Phone: 208-667-7732. Painter's Chair Fine Art Gallery. 223 Sherman Avenue, Coeur d'Alene, ID 83814. Phone: 208-667-3606. Steven A. Scroggins Fine Art. 110 N. 4th, PO Box 1164, Coeur d'Alene, ID 83816. Phone: 208-659-8332. Coeur d'Alene's Old Mission State Park. Located 1 mile east of Cataldo off I-90, exit 39. Coeur d'Alene's Old Mission State Park lies the Mission of the Sacred Heart or Sacred Heart Mission which was built between 1850 and 1853 by Catholic missionaries and members of the Coeur d'Alene Tribe. This park also features a restored Parish House, a historic cemetery and a visitor center with exhibits and gift shop. Coeur d'Alene, ID 83815. Phone: 208-765-7223. Spreading 2.5 million acres, the Idaho Panhandle National Forests consist of the Coeur d'Alene, Kaniksu, and St. Joe National Forests with three local ranger district offices that are located in Coeur d'Alene. Scenic mountain ranges, Selkirk, Cabinet, Coeur d'Alene, and Bitterroot Mountains, are located here as well as the beautiful, wild and scenic St. Joe River. Pend Oreille, Coeur d'Alene, and Priest Lakes are located in the northern region. Coeur D'Alene Summer Theater. Located in Boswell Hall at North Idaho College: 880 W. Garden, Coeur d'Alene, ID 83814. Phone: 208-769-7780. Coeur d'Alene Parkway State Park. Located along the north shore of Lake Coeur d'Alene. Phone: 208-666-6711. Coeur d'Alene Parkway State Park is accessed by taking Exit 15, Sherman Avenue from I-90 or from the city center by driving east on Sherman Avenue and turning onto Coeur d'Alene Lake Drive. This park is located along the north shore of Lake Coeur d'Alene following the North Idaho Centennial Trail Higgens Point. A boat launch along with a picnic area that overlooks the lake is located at Higgens Point. View the Veterans Memorial Bridge or watch for bald eagles at the Bennett bay area. Benches, picnic tables and restrooms are available. Farragut State Park. Located 30 miles north of Coeur d'Alene in Bayview. Phone: 208-683-2425. Once Idaho's largest city and the world's second largest naval training station, Farragut lies on the shores of Lake Pend Oreille approximately 30 miles north of Coeur d'Alene and 10 minutes from Silverwood Theme Park. Park maps, trail guides, campground registration, natural history, park displays and a gift shop are found in the visitor center located at the west entrance of the park. Visit the museum, open from Memorial Day weekend to Labor Day, and the artwork in the Memorial Plaza. Round Lake State Park. Located 10 miles south of Sandpoint. Phone: 208-263-3489. Shaded by towering pine trees, the campsites at Round Lake consist of 15 sites with modern restrooms and showers, picnic tables and barbeque grills. Canoe rentals are available.